73 yo F is seen for weakness. Lab shows Ca of 13.5, Alb of 2.9, iCa of 7.16. PTH is 17, Vit D is 60, 1,25 Vitamin D is 7. Cr is normal. 24 hr proteinuria is around 2 gm. Hgb is 8.6, MCV is 106. B12, and FA is normal. Does not have any history of liver disease. SPEP and S-IFA is negative for any monoclonal proteins. FLC shows less than normal lab, but abnormal labs. Skeletal survey shows diffuse osteopenia. PTHrp is 5.7. Breast exam and lymph node exam is normal. Patient has previously had TAH with BSO. What is the next step in the management. 1. CT chest and abdomen and pelvis to look for malignancies producing PTHrp. BM biopsy shows 25 % plasma cells producing Kappa light chain. Now that MM is diagnosed, how to treat. 60 yo AAM is seen for AKI/CKD. How would you treat the patient. the absence of substantial heart, lung, kidney, or liver dysfunction, or other uncontrolled comorbidities such as diabetes. Based on these features patient is eligible for BMT. How should the patient be treated. BMT Eligible patients should receive myeloablative treatment with melphalan 200 mg/m2 after remission induction by standard first-line treatment. Hence, our patient received Mel 200 mg / m2. Hence, patient received Lenalidomide 15mg for maintenance. The preliminary results of the FIRST trial showed a statistically significant improvement in progression-freesurvivalandoverallsurvivalwhenfirst- line lenalidomide plus dexamethasone treatment was given continuously until progression compared with a fixednumberofcycles. Patient was doing well until 2016, when in late 2016 patient had low back pain. Work up revolved the compression fracture of T11. Further evaluation revealed patient had relapse of MM. What to treat the patient with now? Patient still remans transplant eligible. Since, time of previous transplant is > 12-18 months, Consider reinfection and autologus stem cell transplant. How should this be managed. 77 y/o Male is seen for Syncope. Work up reveals BUN/Cr of 96/2.72. UA shows Specific Gravity of 1.013 and Protein 3 +. Ur Pr/Cr > 10 gm. 24 hr urine shows protein of 20 gm (s-albumin was 2.5). SPEP, SIFA, FLC is done and a result is as below. No DM, HIV -ve. What is the next step in the work up for Nephrotic Syndrome? Ans: Look for Monoclonal Protein. M-spike is present. FLC ratio is abnormal. This is consistent with M-protein being present. But, once M-spike is present, we need a tissue diagnosis to confirm the Amyloidiosis. Hence, Renal biopsy is performed and shows the following. Biopsy, confirms Amyliodiosis. What are the types of Amyloidiosis? What are the clinical manifestation of Amyloidiosis? It is the great imitator. See above. What other work up will be needed? ECHO and EKG. What do you expect to see on ECHO and EKG. ECHO of the heart is normal. EKG is as shown below with relatively low voltage in limb leads. What is the other test that helps in looking for Caridac AL? BNP. It was 17 in out patient. Cardiac AL amyloid deposition is accompanied by marked elevation of the biomarkers BNP and cardiac troponin, even at an early stage. Involvement of the heart is the commonest cause of death in AL amyloidosis and is a major determinant of progno- sis; without cardiac involvement, patients with AL amyloidosis have a median survival of around 4 years,26 but the progno- sis among affected patients with markedly elevated BNP and cardiac troponin (Mayo stage III disease)27 is on the order of 8 months. Once we have confirmed the AL-Type Amyliodiosis, what is the next step? Ans: Confirm the nature of Amyloid. There are > 20 types in total, but 3 major subtypes in Cardiology literature. Next, could this patient have Amyloidiosis due to MM? Bone surgery is negative for MM kind of lessons. BM biopsy. Results are as below. 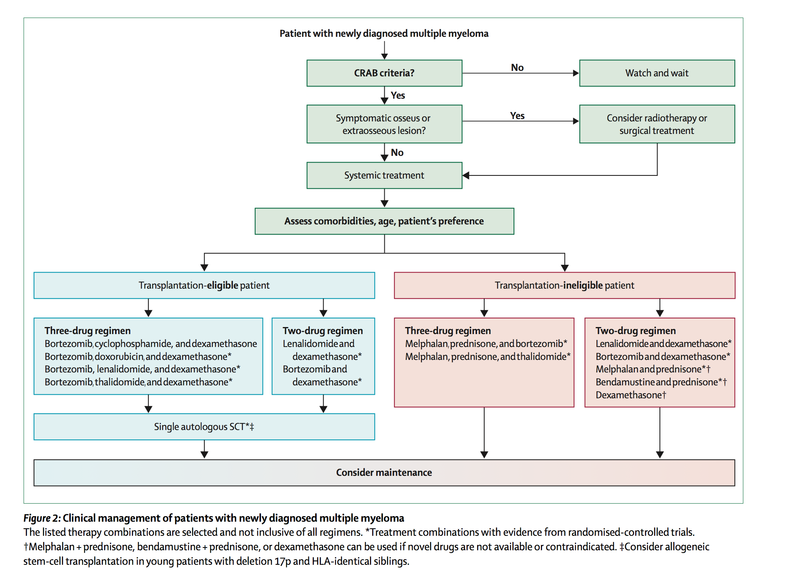 What are the 3 ways to diagnose MM? Does this patient have MM? 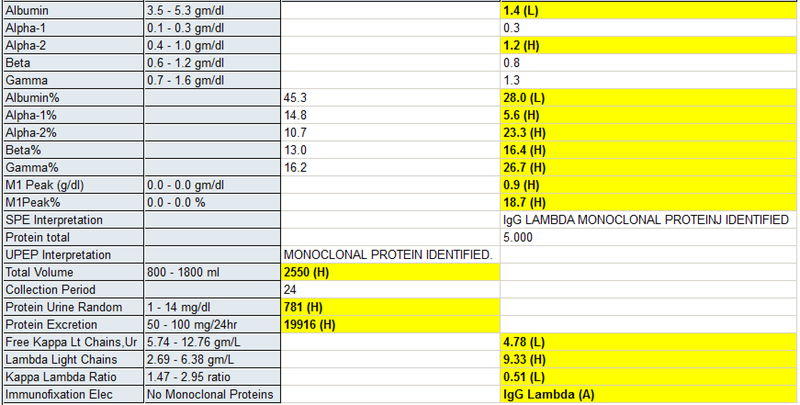 Yes, based on the criteria of Presence of M protein and > 10 % plasma cell this patient does have MM. How do you prognosticate a patient with MM? 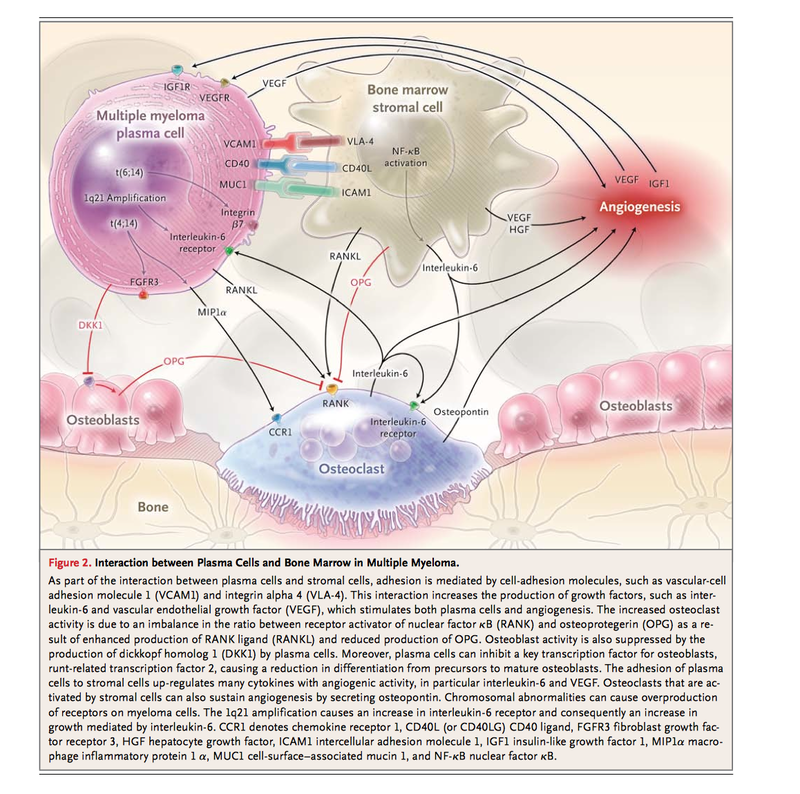 disease biology. Disease biology is dictated by the underlying cytogenetic abnormalities in the myeloma clone. It is a major predictor of outcome and also influences the choice of therapy. Thus, all myeloma patients are risk-stratified at initial diagnosis based on FISH studies on the bone marrow. If FISH is unavailable, conventional cytogenetics can be used as an alternative but is much less sensitive. How is the risk stratification done after reviewing the above? When compared with chemotherapy alone, intensified chemotherapy followed by HCT appears to prolong both event-free and overall survival in previously untreated patients with standard risk myeloma. Hence, SCT would be offered. 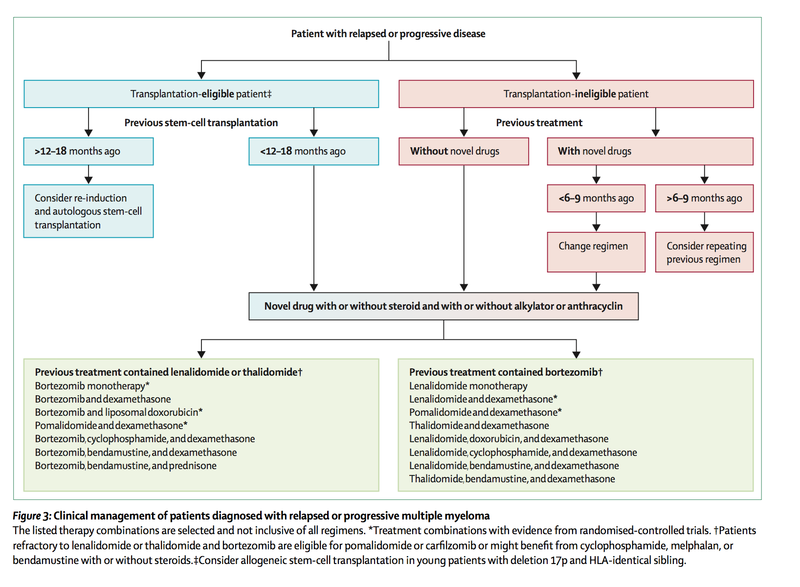 What decides the Transplant eligibility? Does this patient qualify? Our patient does not meet these criteria except for Age. Hence, our patient is not a Transplant eligible in most centers of US. Our patient is a candidate for chemotherapy alone. For most patient, Lenalidomide and dexamethasone is the preferred regimen.